Agua de Jamaica is a traditional Mexican recipe which can be enjoyed as an iced tea. 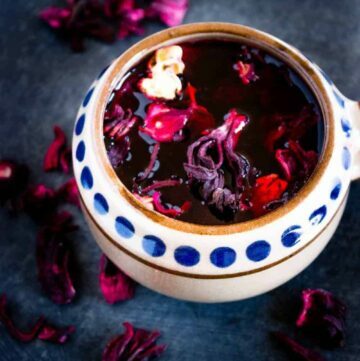 It’s made with hibiscus flowers and therefore has an intense and rich hibiscus flavor. Enjoy it chilled or as a hot comfort drink. Have you ever been in Mexico? If yes, then you must know Agua de Jamaica (Hibiscus Iced Tea). 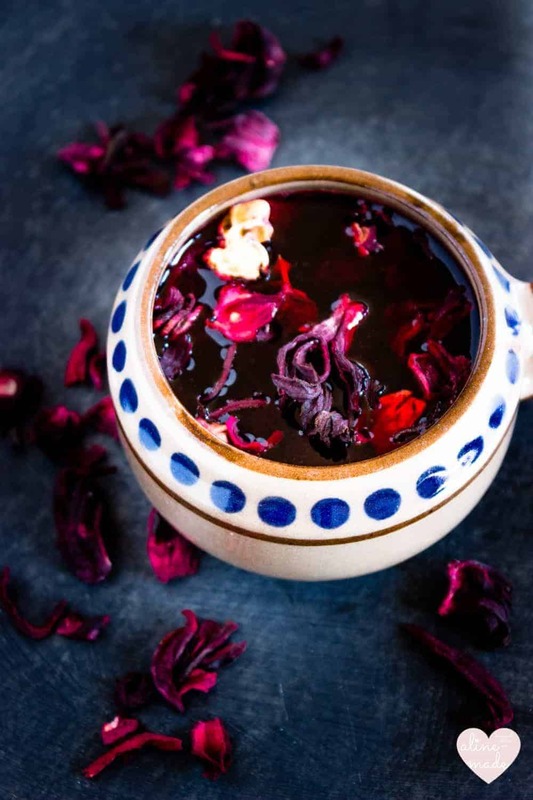 It’s made of dried hibiscus flowers, which are called Flor de Jamaica in Mexico. 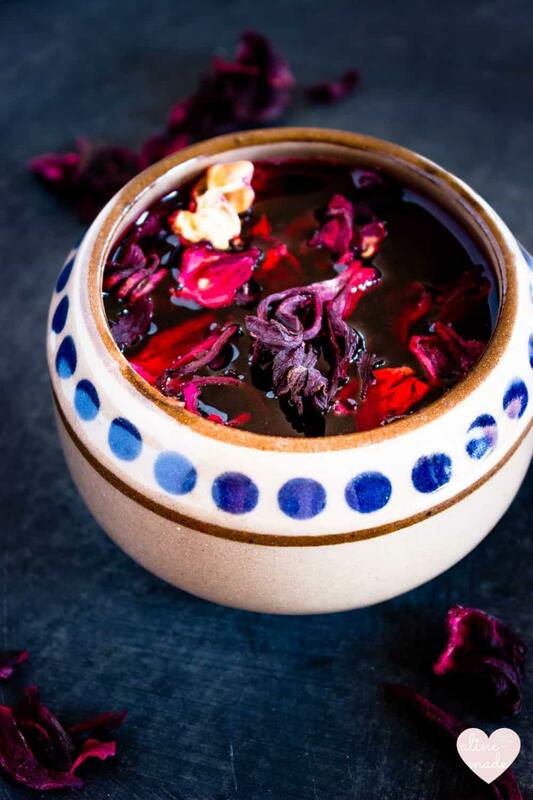 A straightforward procedure, you just have to add dried hibiscus flowers into boiling water, leave them to steep for 10 minutes, add some sugar and pour your mixture through a sieve. Finished. You can either drink it warm or serve it cold. Here in Mexico, people usually drink it chilled. It’s very refreshing on hot days and has an intense smell of the hibiscus flowers which are slightly sweet but have a hint of a sour flavor. Agua de Jamaica, or in English Hibiscus Iced Tea, is one of my favorite drink in Mexico. 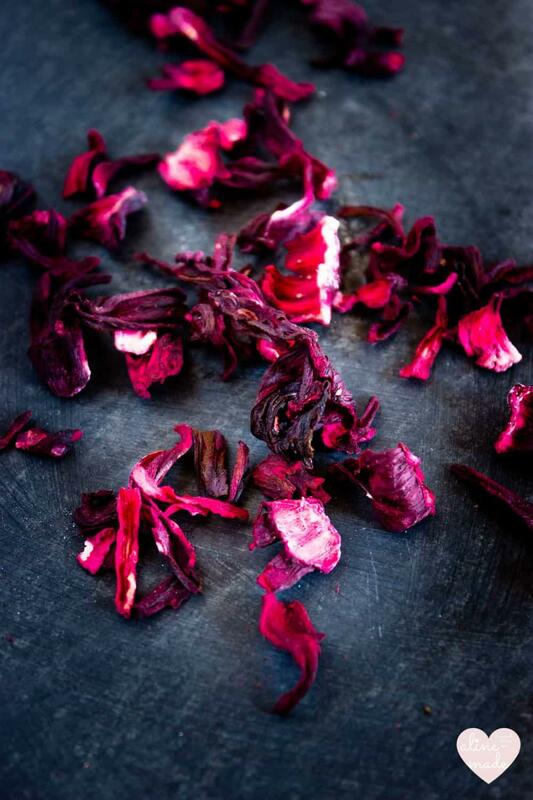 You can imagine that my suitcase is stacked with Flor de Jamaica (dried hibiscus flowers) on my way back to Switzerland. Here in Mexico, you can buy them in every supermarket, and they are quite cheap. Back in Switzerland where I live, it’s not so easy to find them, and they are so expensive. I saw that you can buy them on Amazon but if you ever have the chance to visit Mexico, make sure to take some packages of Flor de Jamaica back home. They are beautiful and have a very intense pink color, perfect for any decoration in your house. Agua de Jamaica or Hibiscus Iced Tea is made of dried hibiscus flowers. Drink it cold on ice cubes or as a hot tea in the winter time. Place the water in a pan and bring it to the boil. Turn off the heat but leave it on the cooking stove. Add the dried hibiscus flowers. After 10 minutes, pour the mixture through a sieve. Add the sugar or honey and mix well. Place your Agua de Jamaica in the fridge for at least one hour before you drink it and serve it on ice cubes. If you try to avoid sugar, you can leave the sugar or honey out. The sugar gives the Agua de Jamaica a more intense flavor, but it’s also very delicious without it. I tried growing Thai Roselle in my garden last year. It needs a long growing season and was just starting to flower at the end of the season, but I was still able to harvest and dry the leaves. Even they make a pretty tasty tea! This sounds great Michelle. To grow it by yourself and then make something delicious out of it ?